Really great service and staff go out of their way to make you feel welcome. The best dentist I have been to & will definitely continue to use Platinum. If you want to straighten your teeth aesthetically without any brackets and wires, Invisalign is the way to go. It’s advanced technology has revolutionized adult orthodontics. The process involves a set of clear, removable aligners that gently moves your teeth and produces surprisingly fast results. 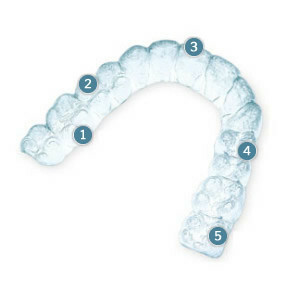 Each set of aligners are custom-made to provide an exact fit. The sets are replaced weekly as your teeth are gradually eased towards their desired position. Invisalign braces are comfortable, clear and removable, and transforms your smile without disrupting your life. The aligners are so discreet that no-one needs to know you’re having orthodontic treatment. Invisalign aligners can be removed to eat and maintain good oral hygiene. You may choose to remove them briefly for special occasions. Your Invisalign provider will take photographs and impressions of your teeth, from which Align technology will produce a 3D treatment plan and your personal custom-made aligners. Your teeth alignment will start right at the beginning. So even before your Invisalign treatment is finished you’ll begin to enjoy the benefits of straighter teeth and a more beautiful smile. Invisalign aligners are comfortable to wear as there are no metal wires or brackets that could potentially irritate your mouth or gums. Some may experience minor discomfort at the beginning of each new treatment stage when they insert a new aligner. Invisalign aligners are virtually invisible so hardly anyone will notice you’re straightening your teeth.